A selection of offices of various size and spacious conference rooms are available in this historical and elegant building. Its conference room can accommodate 12 people. Equipped to a high standard, this building is set in a renowned area and surrounded by the major city's amenities. Within walking distance, there are fitness centres, as well as many restaurants and hotels where you can accommodate your clients. This is a highly sought-after centre owing to its popularity. Your business can benefit from the area's high footfall. 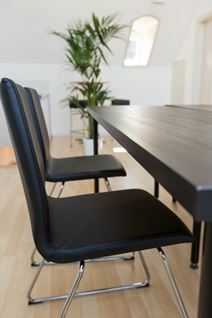 With a choice of shared or fixed desks available this office space is located in the heart of Bern right next to the train station for convenience. A meeting room is also available for use and caters for between two and six people. These offices come furnished, with 24 hour access, mail handling and security. This modern business centre maintains an array of helpful amenities such as spacious meeting rooms, a professional support team, high speed internet and fully furnished office spaces with double glazing, air-conditioning and climate control. The office building is perfectly situated in the heart of Bern and maintains great access to a host of useful amenities, such as banks, hotels, eateries, bars and shopping opportunities. The transport links surrounding this centre are also extensive and extremely well connected.